It’s great to come across uplifting brands with a mission. Such is the case with Lovemore. This sincere shirt company offers a variety of super soft tees and onesies with a simple message, “Love, more.” Using 100% Skal-certified organic cotton, non-toxic azo-free dyes and nickel-free snaps, these comfy garments are a great way to start off your tiny, eco-friendly humanitarian’s wardrobe. A portion of each sale goes toward an amazing non-profit organization called Earth Birth. Earth Birth is run by midwives whose mission is to foster an international women’s health movement that encourages and promotes safe and peaceful birth as an act of social justice and community healing. 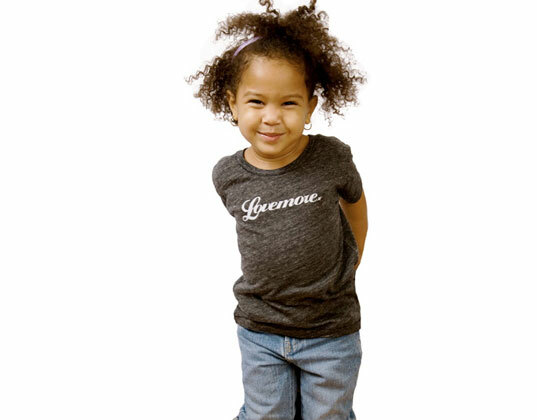 All Lovemore tees and onesies are available in a variety of colors and come in both long and short sleeve styles. Sizes range from 0 – 6 months, 6 – 12 months, 12 – 18 months, 2T, 3T, and 4T. The prices are $24 for short sleeves and $26 for long sleeves. Lovemore carries a variety of tees, hoodies, bags and water bottles for adults as well…so your entire family can Lovemore. It's great to come across uplifting brands with a mission. Such is the case with Lovemore. This sincere shirt company offers a variety of super soft tees and onesies with a simple message, "Love, more." Using 100% Skal-certified organic cotton, non-toxic azo-free dyes and nickel-free snaps, these comfy garments are a great way to start off your tiny, eco-friendly humanitarian's wardrobe. A portion of each sale goes toward an amazing non-profit organization called Earth Birth. Earth Birth is run by midwives whose mission is to foster an international women's health movement that encourages and promotes safe and peaceful birth as an act of social justice and community healing.